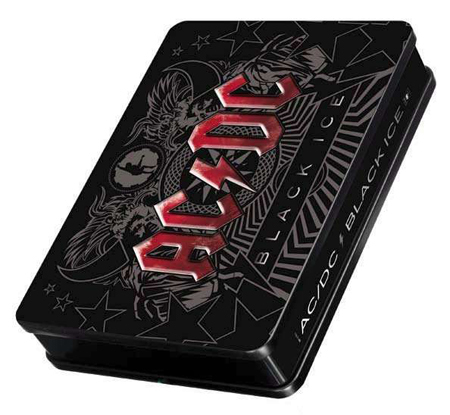 AC/DC's new album "Black Ice" has been released in Germany as a limited-edition "steelbox" containing the CD, a 20-page color booklet, a bonus DVD featuring the "The Making Of Rock N Roll Train" documentary and the "Rock N Roll Train" video, a large AC/DC flag, five stickers and a Gibson guitar pick. The set is limited to 25,000 copies worldwide. According to Billboard.biz, AC/DC has returned to the top of Billboard's European Top 100 Albums chart with "Black Ice" (Columbia/Sony BMG). The album moves 3-1 in its ninth week on the survey, which it led for four weeks in late October and November. It moves 6-3 in Denmark and 7-5 in Switzerland, holding at No. 5 in France. "Black Ice", which was released in the U.S. exclusively at Wal-Mart, has become the fourth-best-selling album of the year with 1.6 million copies sold, despite the lack of any digital sales. The effort made history debuting at #1 on album charts in 29 countries and also has the distinction of being Columbia Records' biggest debut album (since Nielsen SoundScan began tracking sales data for Billboard in March of 1991). "Black Ice" has been certified multi-platinum in eight countries, including the U.S., Australia, Canada, Switzerland, Sweden, Norway, Germany and the Czech Republic. Additionally, "Black Ice" has achieved platinum status in twelve countries (Austria, Belgium, Denmark, Finland, France, Hungary, Ireland, Italy, UK, Argentina, Singapore and New Zealand) and gold status in four countries (Netherland, Spain, Poland and Brazil). With over 6 million copies of "Black Ice" shipped worldwide, combined with over 5.5 million in catalog sold this year, AC/DC has surpassed THE BEATLES as the #1-selling catalog artist in the U.S. for 2008.